Maryland Shingle Roofing & Siding Contractors offers a wide selection of roofing brands, colors and styles for roofing Maryland homes. Call today for a free complete installation or repair estimate! Is it time to replace your Roof? You really don't want to replace your roofing before its necessary but waiting a little too long can be a costly mistake. Getting the maximum life out of your roof and then replacing it before any leaks develop is the right strategy when considering roof replacement. It sometimes helps to know how old your roof is when determining if it's time to replace your roof. Over the years we have found that most builder roofs need to be replaced somewhere around 25 years depending on what type of roofing was used when the home was built. This is just what we have seen over the years and there are exceptions so keep that in mind. When you reach that window of time when roof replacement is approaching here are a few things you may want to consider. Let's first look at a scenario where your roof is nearing the end of its lifespan and is need of a roof repair. Depending on what type of repair is needed should be a consideration if you repair or replace your roof at this time. Generally speaking if your roof repair is going to cost you a few hundred dollars and will allow you to gain another 5 years you'll probably come out ahead. If your repair is a lot more than that you may want to consider all you options for stopping that leaky roof. One thing you don't want to do is pay for multiple roof repairs and then end up replacing the entire roof a year or two later. It a good idea after a severe storm especially a hail storm to walk around your home looking up at the roof for any damage that may have occurred. We do not recommend any homeowner getting on a roof but one thing you can do is walk around your home with a pair of binoculars checking for missing or damaged shingles. Maryland Shingle can assist you with any repairs or full replacement if needed offering a wide selection of quality roofing. 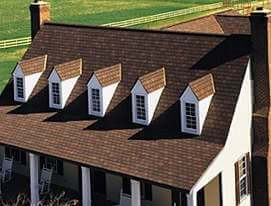 All Maryland Shingle roofs are stripped to bare wood and inspected. After inspection Winterguard Waterproofing Shingle Underlayment is applied to all eaves and valleys. Winterguard offers extra protection in vulnerable areas to prevent leaks into your home from wind driven rain and ice dams. Next Certainteed Roofers Select High-Performance underlayment is applied to the remaining bare sheathing. This quality underlayment provides exceptional wrinkle and tear resistance for a protective water-resistant layer over your roof deck. F-4-1/2 metal drip edging is applied around the entire border of your new roof for additional protection against water infiltration. New Ultimate Pipe Flashing™ plumbing vent pipe collars are installed around plumbing vent pipes. Let me pause for just a moment listing the steps in our replacement process to explain a little more about plumbing vent pipe collars. One of the main failure points in the past on all roofing was the plumbing vent pipe collars. These are the metal and sometimes plastic boots that are placed around your plumbing pipes that penetrate the surface of your roof. Many of these collars would fail before the lifespan of the roof forcing homeowners to pay for a repair on a otherwise sound roof. Options on these collars were limited in the past with no real solution to the problem until now. As of 2014 Maryland Shingle will be installing new Ultimate Pipe Flashing™ plumbing vent pipe collars on every new roof we install. In our opinion without question these are the very best plumbing vent pipe collars available on the market today. Ultimate Pipe Flashing™ plumbing vent collars are guaranteed for the life of the original roof installation solving one of the main failure points in all roofs. It's hard to explain what a huge improvement Ultimate Pipe Flashing™ collars have brought to the table. Needless to say we are pretty excited to be offering Ultimate Pipe Flashing™ collars on every new roof. Now back to our installation process! If your home has a brick chimney we will install a new aluminum base and prefinished aluminum counter flashing for a lasting seal. Once all these steps are completed Maryland Shingle installs your choice of High Quality Shingles capped off by Shingle Vent II ridge vent ventilation if applicable. One important note we need to add here is all of our shingles are installed with roofing nail application and never stapled. All gutters are cleaned with all trash debris removed. Protection tarps are removed and clean up is completed with a magnetic pick up followed by power air blow off of all surrounding areas. We make it one of our top priorities to leave every job as clean as possible after our highly skilled work force completes the exterior remodeling of your home. Written warranties, which provide you with peace of mind, are included with every completed job. As you can see the Maryland Shingle philosophy is to provide outstanding craftsmanship in combination with top quality materials. You may not know a lot about selecting a contractor, but you’ve found that the only thing you really need to know when installing your new roof and that’s Maryland Shingle! For a free no obligation assessment contact us now by e-mail or phone and join the growing number of homeowners who choose Maryland Shingle for beautiful new roofing!